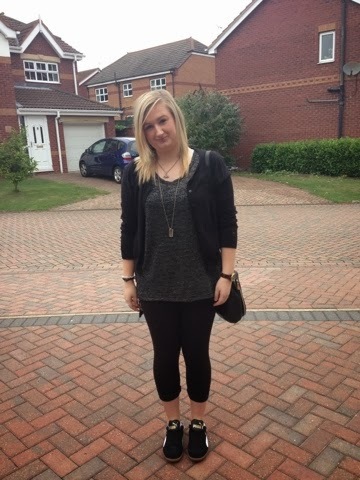 This is such a rubbish quality photo and I feel I look a bit stupid but its not very often I post a full length #OTTD and this was taken by my mum outside of my house last week when I was back home, so I thought I may as well post it :). If you read my Blog you will know I do Love my various pairs of trainers so this is one of the ways I style them :).These trainers are my Puma Liga suade they are really comfortable, and I feel they are easy to style and they are just simply black and white with a touch of gold writing. The top I'm wearing was actually my mums but I liked it so it has now come back to uni with me (this is an regular occurrence). I am working on stealing my mums camera to bring back to uni with me to so I able to take better quality photographs ! I'm back at uni this week and I'm enjoying it so far ! really glad to be back after 5 months off !! I'm now a 2nd year and things are getting exciting. I went to the student lock-in event at Manchester Arndale shopping centre last night so look out for my new purchases post ! Guilt free shopping due to the student discount ! && if your back at uni I hope your enjoying I too.